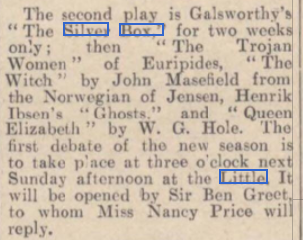 Charles Mortimer played Snow, in the production of "The Silver Fox", at the Little Theatre, London, from 31 October to 19 November, 1932. 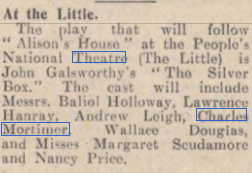 This was produced by The People's National Theatre, and the play was written by John Galsworthy.The cast included Miss Nancy Price, Mr Baliol Holloway, Mr Wallace Douglas, Mr Charles Mortimer, Mr Andrew Leigh, Mr Lawrence Hanray, and Miss Margaret Scudamore. 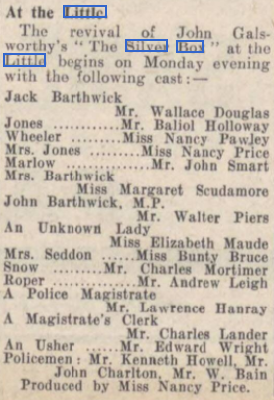 From the Stage - Thursday 27 October 1932.